Download "Napa Valley College Fall 2015 Math 106-67528: College Algebra (Prerequisite: Math 94/Intermediate Alg.)" 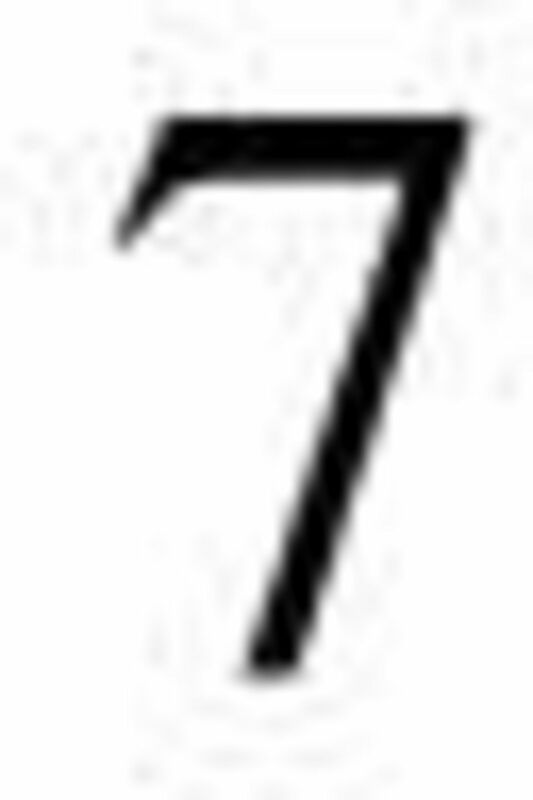 1 1 Napa Valley College Fall 2015 Math : College Algebra (Prerequisite: Math 94/Intermediate Alg.) Room 1204 Instructor: Yolanda Woods Office: Bldg Rm. 1031R Phone: M-Th 9:30-10:35 p.m. * * is the best way to reach me. I check it often Office Hours: M-Th:10:45-noon Welcome to College Algebra! Course Content: As a preparatory course for Trigonometry and Calculus, we study polynomial, rational, exponential and logarithmic functions from a numerical, graphical and analytical perspective. Series, sequences and conic sections are also included. Student Learning Outcomes: A successful student of the course will be able to: Graph polynomial, rational, radical, exponential, logarithmic equations with or without a calculator. Solve polynomial, rational, radical, exponential, logarithmic equations and systems of equations. Manipulate and evaluate mathematical sequences and series. Required Materials: Text: Precalculus Enhanced with Graphing Utilities. The hard copy is optional, but the e-book, which includes MyMathLab (MML) access is required and must be purchased. Your homework and online weekly quizzes will be taken and submitted using MyMathLab online. You must have reliable online access to be able to fulfill the requirements of this course and must register for MML online by this Friday. Note that temporary access is available for 2 weeks without having to pay. There is no excuse for not enrolling. Failure to enroll in MML may result in being dropped from the class. A course ID is needed to enroll. 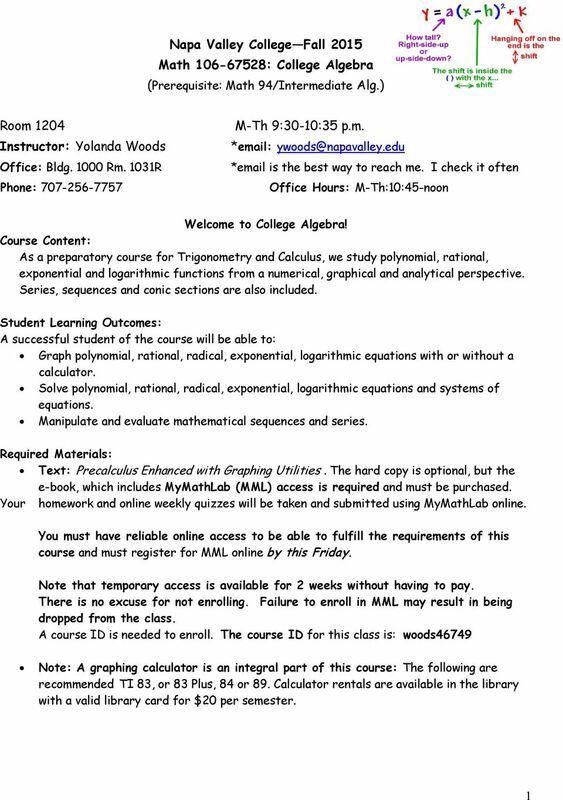 The course ID for this class is: woods46749 Note: A graphing calculator is an integral part of this course: The following are recommended TI 83, or 83 Plus, 84 or 89. Calculator rentals are available in the library with a valid library card for $20 per semester. 2 2 Attendance: Consistent attendance is of utmost importance. More than one week s worth of missed class may result in being dropped from the class. Consistent attendance will be one measure of determining borderline grades. I will enforce this after 4 absences, so please make sure you make it to class. Skipping class occasionally will get you dropped after 4. Keep track of your absences and save absences for true emergencies or illness. Leaving early will count as an absence. Tardies: You are expected to come to class on time. Tardy students are a disruption to instruction. 3 tardies to class will count as an absence. Tardiness will be a factor in determining borderline grades. *In-Class Practice Assignments: We will regularly do in-class problem practice. Warm-ups: Most days we will begin class with a warm-up. You are expected to do these when class begins. We will go over these problems as a review of the previous day s lesson or as an introduction to the day s work. These should be dated. Worksheets/Practice: We will also work sample problems from worksheets. 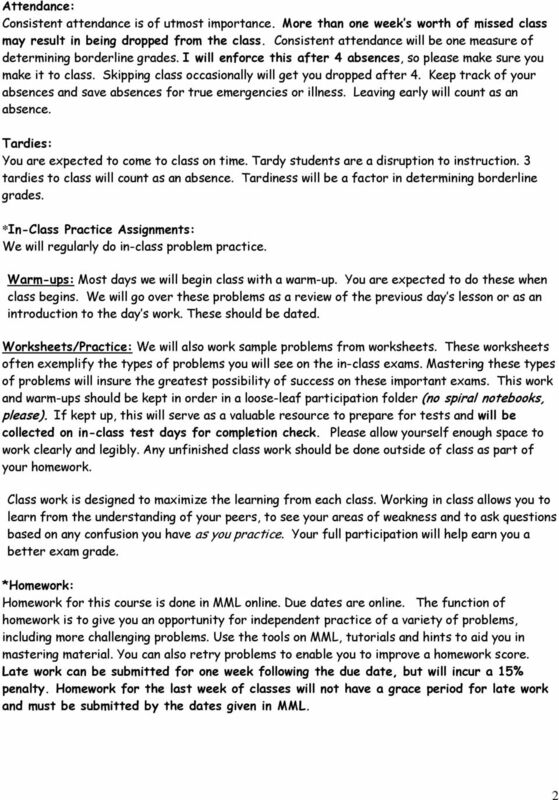 These worksheets often exemplify the types of problems you will see on the in-class exams. Mastering these types of problems will insure the greatest possibility of success on these important exams. This work and warm-ups should be kept in order in a loose-leaf participation folder (no spiral notebooks, please). If kept up, this will serve as a valuable resource to prepare for tests and will be collected on in-class test days for completion check. Please allow yourself enough space to work clearly and legibly. Any unfinished class work should be done outside of class as part of your homework. Class work is designed to maximize the learning from each class. Working in class allows you to learn from the understanding of your peers, to see your areas of weakness and to ask questions based on any confusion you have as you practice. Your full participation will help earn you a better exam grade. *Homework: Homework for this course is done in MML online. Due dates are online. The function of homework is to give you an opportunity for independent practice of a variety of problems, including more challenging problems. Use the tools on MML, tutorials and hints to aid you in mastering material. You can also retry problems to enable you to improve a homework score. Late work can be submitted for one week following the due date, but will incur a 15% penalty. Homework for the last week of classes will not have a grace period for late work and must be submitted by the dates given in MML. 3 3 Working in MyMathLab: If this is your first time working with MML online, you will have to get used to the procedures. Here are a few things you should know: After completing a problem you type in your answer and the computer will give you instant feedback. Become familiar and use the features of the software such as Show me an example to get the most out of it. Each homework assignment will have a due date posted online. Please be aware that computer or internet malfunctions will not excuse you from due dates, putting off the entire assignment until the due date is not a good idea as you risk losing your internet connection or having a server go down. Give yourself enough time and have a backup in mind in case of problems. Also please note that you only have a week s grace for late homework. *Online Quizzes and Tests: There will be an online quiz every Friday. The due date and time will be shown online. This is on your own time; please plan for this. 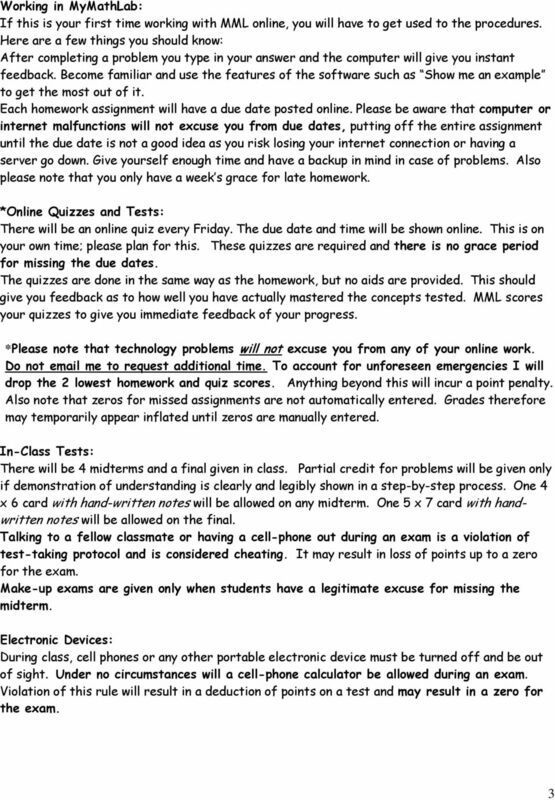 These quizzes are required and there is no grace period for missing the due dates. The quizzes are done in the same way as the homework, but no aids are provided. This should give you feedback as to how well you have actually mastered the concepts tested. MML scores your quizzes to give you immediate feedback of your progress. *Please note that technology problems will not excuse you from any of your online work. Do not me to request additional time. To account for unforeseen emergencies I will drop the 2 lowest homework and quiz scores. Anything beyond this will incur a point penalty. Also note that zeros for missed assignments are not automatically entered. Grades therefore may temporarily appear inflated until zeros are manually entered. In-Class Tests: There will be 4 midterms and a final given in class. Partial credit for problems will be given only if demonstration of understanding is clearly and legibly shown in a step-by-step process. One 4 x 6 card with hand-written notes will be allowed on any midterm. One 5 x 7 card with handwritten notes will be allowed on the final. Talking to a fellow classmate or having a cell-phone out during an exam is a violation of test-taking protocol and is considered cheating. It may result in loss of points up to a zero for the exam. Make-up exams are given only when students have a legitimate excuse for missing the midterm. Electronic Devices: During class, cell phones or any other portable electronic device must be turned off and be out of sight. Under no circumstances will a cell-phone calculator be allowed during an exam. Violation of this rule will result in a deduction of points on a test and may result in a zero for the exam. 4 4 Resources: Napa Valley College offers valuable resources for student success. I encourage you to take advantage of the Math Center located in the 800 building. Tutoring is recommended for all whether or not you are experiencing difficulty. Discussion with an able tutor or study partner enhances student understanding. Additionally MML offers online instructional videos to reinforce class instruction. Students in need of accommodations in the college learning environment: Any student who feels she or he may need an accommodation based on the impact of a learning disability should contact Learning Services in the Library and Learning Resource Center (LLRC), room 1766, phone (707) A Learning Disability Specialist will review your needs and determine appropriate accommodations. If you need accommodations for physical or other types of disabilities, schedule an appointment with DSPS Counselor, Sheryl Fernandez, in the Counseling Department located in the General Counseling Center in the 1300 building, phone (707) for appointment. All information and documentation is confidential. Please feel encouraged to make an appointment with me privately to discuss your specific learning needs in my class after you have gone through the process. 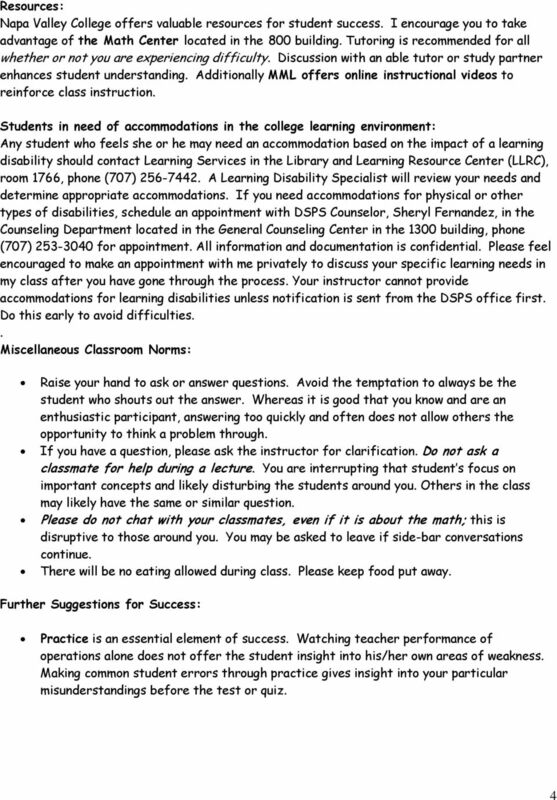 Your instructor cannot provide accommodations for learning disabilities unless notification is sent from the DSPS office first. Do this early to avoid difficulties.. Miscellaneous Classroom Norms: Raise your hand to ask or answer questions. Avoid the temptation to always be the student who shouts out the answer. Whereas it is good that you know and are an enthusiastic participant, answering too quickly and often does not allow others the opportunity to think a problem through. If you have a question, please ask the instructor for clarification. Do not ask a classmate for help during a lecture. You are interrupting that student s focus on important concepts and likely disturbing the students around you. Others in the class may likely have the same or similar question. Please do not chat with your classmates, even if it is about the math; this is disruptive to those around you. You may be asked to leave if side-bar conversations continue. There will be no eating allowed during class. Please keep food put away. Further Suggestions for Success: Practice is an essential element of success. Watching teacher performance of operations alone does not offer the student insight into his/her own areas of weakness. Making common student errors through practice gives insight into your particular misunderstandings before the test or quiz. 5 5 Along with visiting the Math Center, studying with a partner often is a useful way to discuss and clarify confusion. Research has shown that group work in math leads to better understanding. Copying other s work however is cheating and will result in a zero for any assignment or test. Be patient with the learning process. Develop coping strategies to get you through some initial uncertainty. Difficult courses have a learning curve and require persistence and effort. Lastly, read the book, use the online resources, ask questions and persevere. It bears remembering that a good rule of thumb for a college-level course is to spend 2 hours at home studying for every hour in class. Do not expect success just by passively sitting in class taking notes. Math is often difficult, but for most, reward follows effort. Grades: Online Homework: 10%. Weekly Quizzes: 20% cumulative. 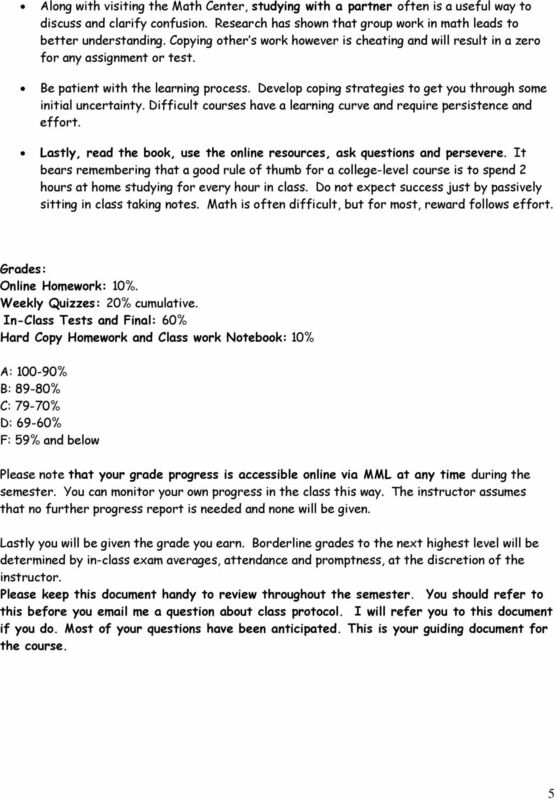 In-Class Tests and Final: 60% Hard Copy Homework and Class work Notebook: 10% A: % B: 89-80% C: 79-70% D: 69-60% F: 59% and below Please note that your grade progress is accessible online via MML at any time during the semester. You can monitor your own progress in the class this way. The instructor assumes that no further progress report is needed and none will be given. Lastly you will be given the grade you earn. Borderline grades to the next highest level will be determined by in-class exam averages, attendance and promptness, at the discretion of the instructor. Please keep this document handy to review throughout the semester. You should refer to this before you me a question about class protocol. I will refer you to this document if you do. Most of your questions have been anticipated. This is your guiding document for the course. 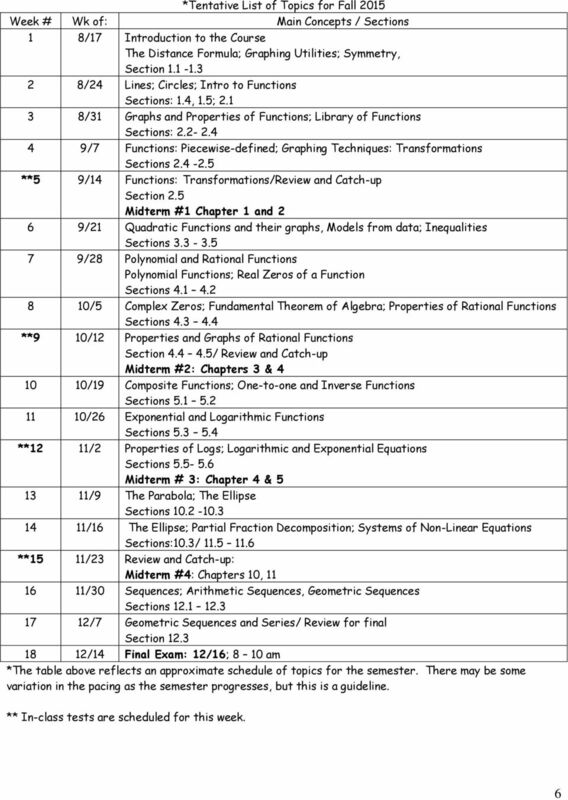 6 6 *Tentative List of Topics for Fall 2015 Week # Wk of: Main Concepts / Sections 1 8/17 Introduction to the Course The Distance Formula; Graphing Utilities; Symmetry, Section /24 Lines; Circles; Intro to Functions Sections: 1.4, 1.5; /31 Graphs and Properties of Functions; Library of Functions Sections: /7 Functions: Piecewise-defined; Graphing Techniques: Transformations Sections **5 9/14 Functions: Transformations/Review and Catch-up Section 2.5 Midterm #1 Chapter 1 and 2 6 9/21 Quadratic Functions and their graphs, Models from data; Inequalities Sections /28 Polynomial and Rational Functions Polynomial Functions; Real Zeros of a Function Sections /5 Complex Zeros; Fundamental Theorem of Algebra; Properties of Rational Functions Sections **9 10/12 Properties and Graphs of Rational Functions Section / Review and Catch-up Midterm #2: Chapters 3 & /19 Composite Functions; One-to-one and Inverse Functions Sections /26 Exponential and Logarithmic Functions Sections **12 11/2 Properties of Logs; Logarithmic and Exponential Equations Sections Midterm # 3: Chapter 4 & /9 The Parabola; The Ellipse Sections /16 The Ellipse; Partial Fraction Decomposition; Systems of Non-Linear Equations Sections:10.3/ **15 11/23 Review and Catch-up: Midterm #4: Chapters 10, /30 Sequences; Arithmetic Sequences, Geometric Sequences Sections /7 Geometric Sequences and Series/ Review for final Section /14 Final Exam: 12/16; 8 10 am *The table above reflects an approximate schedule of topics for the semester. There may be some variation in the pacing as the semester progresses, but this is a guideline. ** In-class tests are scheduled for this week. MESA College Math 96 -- Intermediate Algebra and Geometry. You MUST have daily access to email and internet. MATH 2103 Business Calculus Oklahoma State University HONORS Spring 2015 Instructor: Dr. Melissa Mills 517 Math Sciences memills@math.okstate.